Pittsburgh: a sprawling modern Earth city stranded in the heart of virgin forest on Elfhome. Sixty thousand humans, twenty thousand black-winged tengu, ten thousand elves, an unknown number of invading oni, four unborn siblings of an elf princess, three dragons, and a pair of nine-year-old geniuses. Jane followed Hal down the hall wishing it wasn't a good thing they were known for their mayhem. 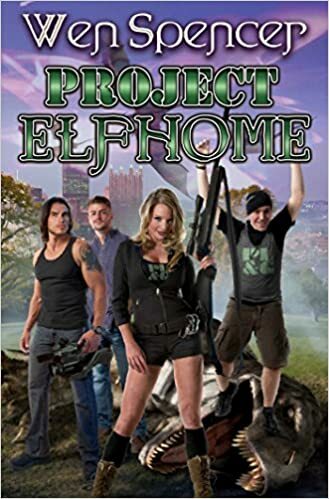 Stories exploring the fascinating realm of Elfhome, a world where modern day Pittsburgh has collided with the kingdom of the Elves. A special entry in the the best-selling Romantic Times Sapphire award winning Elfhome series. Contains some of Wen Spencer's best shorter works including gems "Bare Snow Falling on Fairywood," "Pittsburgh Backyard and Garden," "Peace Offering,” and more tales set in the world of best-selling Elfhome series entries Tinker, Wolf Who Rules, Elfhome, and Wood Sprites! Love that opening. Never read one like that for a fantasy. Had to smile about being known for mayhem:) Sounds fun. Sounds like a fascinating cast of characters! Great opening paragraph and 56 excerpt. My Friday post features CHESTNUT STREET. This sounds intriguing although not my usual fare. Enjoy! Very interesting beginning, that's quite a list! Not my usual genre, but you do have my interest! Seems like it has a style all its own. Looks like a lot of fun. Happy Friday! I'm going to be adding this to my tbr! Sounds interesting - thanks for sharing! Very interesting. I'll have to add it to my TBR pile.